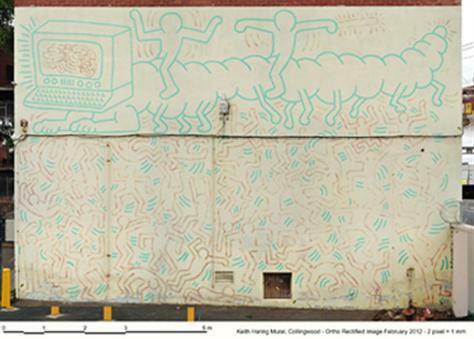 The Keith Haring Mural was a project completed over the course of five days from the morning of Saturday 3rd March, 1984 to Thursday, 8th March, 1984 at Collingwood Technical College. The project not only embodied Keith Haring's active joy in collaborating with young people, but as his second major work in Melbourne, was a piece that garnered attention for the suburb of Collingwood and established what is now an appreciated public artwork and bold example of street-art culture in the 1980s. The site for the mural eventually chosen by Haring, described by a student as "a large, blank wall overlooking Johnson St" was thoughtfully organised by teacher Mr. Ray Collier, whom also judged an in-school student design competition to raffle souvenir t-shirts donated by Haring after the mural's completion. “What’s going on in the bottom is about – I mean, all these people are doing different things, right? Some of them are like dancing, like rap dancing, or acrobatics. Some of them are almost like they are fighting. But the way they are all together means that they can’t – I mean, if one of them comes out, the whole thing falls down. So they sort of depend on all of them to make it work. So it’s sort of like society or whatever, where the world only works when lots of individuals do their part, right? Since the closure of Collingwood Technical College in 1987, the mural eventually faded into disrepair until community and public response prompted a recent conservation project initiated by Arts Victoria. The conservation project of the now Heritage-listed public artwork was led by renowned Italian conservator Antonio Rava, and was successfully completed in 2013. Today, the mural once again serves as a vibrant reminder of Collingwood's history, and contributes to the folio of a contemporary Melbourne artistic scene. The mural now remains as part of the Circus Oz and Arts Victoria occupied complex where it exists as one of only 31 Keith Haring works known to be still in existence worldwide. More information about the mural can be found on Tom Jurkovic's page, who was an active student at the time and featured in the video taken of the mural project in 1984. Videos sourced from the ABC and Arts Victoria.